1. Always ensure you write a return address on the back of the envelope or parcel. This way if your mail is not delivered or collected it can be returned to you. 2. Make sure you clearly write the address your mail is being sent to. Remember to include Lot number or house number, street name and postal zone or Post Office name. 3. Help your postman to deliver your mail to the correct address by erecting a mailbox. 4. Ensure your mailbox is accessible to the postman; this way you’ll be sure to have your mail delivered. 5. It is never a wise idea to send cash through the mail, instead, consider using a cheque or money order. 6. For added security, consider registering your mail. 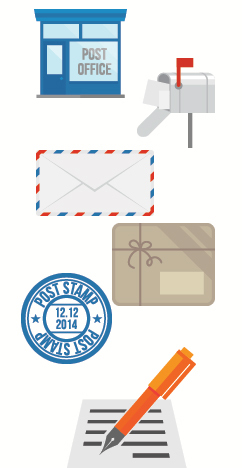 Both you and the Post Office will be able to track your mail from time of posting to delivery. 7. It is your responsibility to package your fragile items properly with bubble wrap or other cushioning. Don’t forget to clearly write FRAGILE on your package and point them out to the post office staff. 8. Not all items can be sent by mail, so before you do, ask your local post office. 9. Find out what types of items may be prohibited, or restricted or are considered dangerous before you send by post. 10. If you’re sending or receiving a parcel ensure you include an invoice. Failure to do so may result in your package being detained by Customs or a Customs Officer assigning a value based on their own research. It could cost you more than you paid. 13. Ask if the postal service you are being offered provides coverage for your item in the unlikely event of loss or damage, and if so for how much. 14. When buying goods on the internet, make sure the sender uses the postal product most suitable for your delivery timeline. 15. When purchasing vitamins and supplements from overseas ensure they are mailed to you in their original containers that are properly labelled identifying the ingredients. 16. Ensure medication being sent from overseas is accompanied by a prescription. This will facilitate quicker and smoother processing of your item and help health officials to swiftly determine whether the item can legally enter the country. 17. Ask about the mail service which best suits your needs.